I suppose you could call these "half yeast roll and half savory muffin". But really, that doesn't quite convey their special magic: imagine the alluring taste of soft yeast rolls but the baking convenience of muffins, no rise time, no wait, no fussy roll formation. Moms and dads are known for magical powers. Just think of the owies and ouchies that vanish with a quick kiss and a warm hug, how a child’s excitement flourishes with words of encouragement and praise. But how do busy parents transform soups and salads from weeknight same-old to weeknight special? It’s no illusion. Straight from the oven, hot rolls are a magic of their own sort. But after work and errands, before homework and bedtime rituals, what busy parent has time to wave a wand for rolls? These rolls require no kneading and no time to rise. Just mix the batter and bake, like muffins. The rolls’ texture lands someplace between fluffy homemade rolls and hearty homemade muffins. Stir in some fresh herbs or add a honey-sweetened butter. Suddenly, supper is something special, magical even. Extra Magic? Honey Butters! For a little something special, whip up a small batch of honey butter. The only trick is to use butter softened at room temperature, it really doesn't work to soften it in the microwave. But if you must, cut the butter into cubes and run the microwave just 5 or 10 seconds at a time. 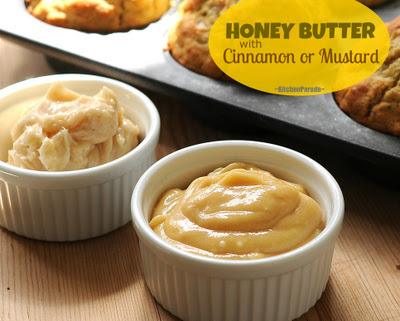 HONEY CINNAMON BUTTER Stir a tablespoon of honey and a pinch of cinnamon into a half stick of softened butter. HONEY MUSTARD BUTTER Stir a tablespoon of honey and a tablespoon of good mustard into a half stick of softened butter. ALANNA's TIPS You may skip separately mixing the flour, baking powder and salt but only by carefully distributing the salt and baking powder so no salty, powdery pockets get trapped inside the dough. The rolls are quite big, you could easily stretch the recipe to fill 18 muffin cups. Heat oven to 425F. Spray the cups of a muffin tray with standard-size cups. YEAST In a bowl, stir together the yeast and water, set aside. WET INGREDIENTS In a bowl large enough to become the main mixing bowl, whisk the egg, sugar and oil. DRY INGREDIENTS Separately, stir together flour, baking powder and salt (see ALANNA’s TIPS). With a wooden spoon, stir dry ingredients a cup at a time into the wet ingredients, just until mixed, stirring in a third of the yeast-water mixture between additions. Stir in herbs, if using. With two soup spoons, one to scoop and the other to scrape, fill the muffin tins. Bake for 20 minutes or until golden. Cool for 5 minutes. Best served hot but keep well for two to three days. NUTRITION ESTIMATE Per Roll, assuming 18/12: 144/216 Calories; 3/5g Tot Fat; 0/1g Sat Fat; 24/36g Carb; 1g Fiber; 425/638mg Sodium; 11/17mg Cholesterol; 4/6g Protein. WEIGHT WATCHERS POINTS WW Old Points 3/4.5 & WW Points Plus 4/6. 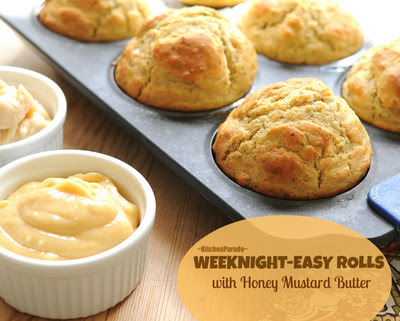 Weeknight-Easy Rolls are savory rolls, no sugar. So I pair them with easy-to-whip-up honey butters, just butter and honey plus another little something. My favorite is Honey Mustard Butter but Honey Cinnamon Butter is fabulous too. When I make these, I feel like my Auntie Gloria, who always had a "special little bit of something special" she could pull out of the fridge on a moment's notice. For easy bookmarking and searching, here are the recipes, above, Honey Butters. Kitchen Parade is written by second-generation food columnist Alanna Kellogg and features fresh, seasonal dishes for every-day healthful eating and occasional indulgences. In 2009, Kitchen Parade celebrates its 50th anniversary with a special collection of my mother's recipes. Do you have a favorite recipe that other Kitchen Parade readers might like? Just send me a quick e-mail via recipes@kitchen-parade.com. Quick Suppers are Kitchen Parade favorites and feature recipes easy on the budget, the clock, the waistline and the dishwasher. How to print a Kitchen Parade recipe. If you like Kitchen Parade, you're sure to like my food blog about vegetable recipes, too, A Veggie Venture. "Like" Kitchen Parade on Facebook! Sounds delicious and super simple. That's as easy as those frozen things in a tube. Finally I was able to try the weeknight rolls and they are good, aren’t they? Sort of a cross between a muffin and a yeast roll – I put the leftovers in a freezer bag and think they will come out Ok to heat up in the microwave, like non-yeast breads do. Hi Alanna! Question for you....is bread flour a specific kind of flour? Different than cake flour or self rising flour or the regular flour I have? Can I use any of those listed instead? Hi Lelo ~ Good question! Gluten is what gives baked goods their 'chewiness'. Bread flour has the most gluten (and thus is best for heavier baked goods like bread), cake flour the least (and so is used for lightening things like the angel food cake I made today), and all-purpose flour is in the middle. I use bread flour in this recipe because I like how the texture it gives these rolls. As for the self-rising flour, it's an all-purpose flour that already has baking powder added (1 1/2 teaspoons per cup) so you can use it, with a lighter, less roll-like result, just do the math and reduce the specified baking powder. Let me know how it goes! These were a big hit at my house. 15-year-old boys love them! Can't wait to try them with some garlic and herbs. Hello The Sister - So glad you and 'A from Texas' like these! Hi Alanna - I had no idea you had a blog. My mother-in-law clips your column for me in St. Louis and mails it to us in Ireland. I've tried several of your recipes and just made these rolls. Am so excited to find your site and will be back I'm sure! Keep up the great work!